Remember that Foxconn deal? Trump strutting around with Scott Walker, talking about bringing thousands of high paying manufacturing jobs to Wisconsin? Are you surprised to find out that it is a typical Trump con job? 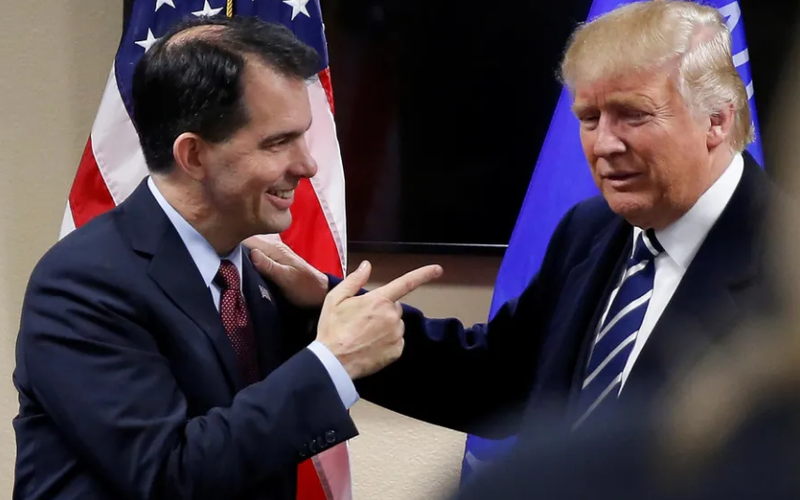 The idea of putting the plant in southeastern Wisconsin originated in April of 2017, during a helicopter ride President Donald Trump took with Reince Priebus, a Wisconsin native and Trump’s chief of staff at the time. Flying over Kenosha, Priebus’s home town, they passed the empty lot that once held the American Motors Corporation plant. “Why is all that land vacant?” Trump asked, according to an account Priebus gave to a Milwaukee television station. “That land should be used.” When Terry Gou, Foxconn’s chairman, came to the White House to discuss Foxconn’s desire to build a U.S. factory, Trump suggested the site in Kenosha. It wasn’t big enough, but the town of Mt. Pleasant, fifteen miles north, pursued the company aggressively, and was ultimately selected by Foxconn in October of 2017. But as the public has become aware of the spiralling costs for these jobs, the Foxconn deal has become something of a political liability for Walker, particularly among voters outside of southeastern Wisconsin. Those costs include taxpayer subsidies to the company totalling more than $4.5 billion, the largest subsidy for a foreign corporation in American history. Since Wisconsin already exempts manufacturing companies from paying taxes, Foxconn, which generated a hundred and fifty-eight billion dollars in revenue last year, will receive much of this subsidy in direct cash payments from taxpayers. Depending on how many jobs are actually created, taxpayers will be paying between two hundred and twenty thousand dollars and more than a million dollars per job. According to the Legislative Fiscal Bureau, a nonpartisan agency that provides economic analysis to the Wisconsin state legislature, the earliest citizens might see a return on their Foxconn investment is in 2042. Walker is in trouble and this has a lot to do with why. No one should be surprised. He ran through tens of millions in donations for his presidential race before the primaries even started, and he was the first one to drop out. "Fiscal responsibility" isn't his strong suit. I can't tell you how happy it will make me to see this guy defeated.